Gabor in a sailor outfit. Gabor Neumann was born on February 10th, 1940 in Bekescsaba, Hungary. The son of Elek and Margit Neumann, Gabor was just four years old when he was deported to Auschwitz and murdered on June 29th, 1944. The photograph was submitted to Yad Vashem by Gabor’s brother Peter Namenyi, who lives in Hungary. Louis (Adolf) Swabe was born on January 13, 1902, in Groningen, Netherlands. He married Geertruida Feeler, and they lived in Amsterdam. Louis and Geertruide were both murdered on July 23, 1943, in the Sobibor extermination camp. 250,000 Jews were gassed in Sobibor. The photograph was submitted to Yad Vashem by David Kool, the couple’s nephew, who lives in Holland. Heinrich Jacoby was born in Belgard, Germany on October 15, 1864. His wife Margarete was born in Eidtkonen, Germany on November 11, 1875. They were deported from Germany and perished in Theresienstadt – Heinrich on January 18, 1943, age 79, and Margarete on August 22, 1943, age 68. The photograph was submitted by their daughter, Julia Faerber Jacoby, who lives in France. Marina, daughter of Nahum and Anna-Nyuta Smargonski, was born in Riga, Latvia on 30 August 1938. During the war, the family lived in Riga, and Marina perished in the Riga ghetto in December of 1941. She was only 3 years old. Her father, Nahum, perished in a concentration camp in Germany. The photograph was submitted to Yad Vashem by Anna Yarshov (formerly Smargonski), Marina’s mother. Moshe Manela was born in the town of Kielce, Poland in 1908. He married Bluma Citron, and their daughter, Guta, was born in 1937. All three were murdered in Treblinka in 1942 – Moshe was 34, his wife Bluma 33, and Guta was just five years old. 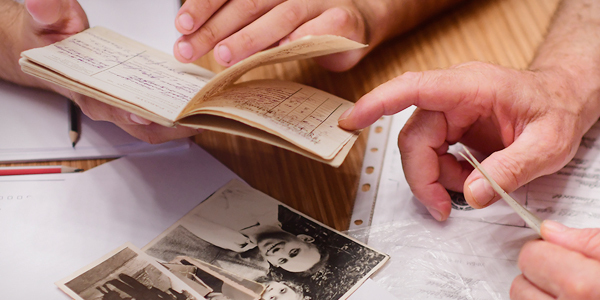 The Pages of Testimony in their memory and the photograph were submitted to Yad Vashem by Arieh Citron-Hadari, Moshe's brother-in-law and Guta's Uncle. Kurt Peckel, son of Adolf and Pauline Peckel, was born on 9 March, 1897 in Inse, Germany. He married Frania Kalter, and they had a son, Adolf. The family lived in Leipzig, Germany, and during the war, they moved to Southern France. On 31 August 1942, Kurt, Frania and Adolf were deported on the 26th transport from the Drancy transit camp to Auschwitz, where they all perished. The family photograph was submitted to Yad Vashem by Horace Peck (formerly Peckel), Kurt’s brother, who lives in the US. Valentina, daughter of Arkadi and Liudmila Zbar, was born in 1935 in Kharkov, Ukraine. She perished there with her parents in 1941. She was six years old. The photograph was submitted to Yad Vashem by Dmitri Kamyshan, Valentina’s cousin. Yehiel, son of Abek (Abba) and Miriam Mintzberg, was born in Radom, Poland. He lived in Radom during the war, until October 1942, when he was deported to Treblinka, where he was murdered. He was ten years old. The photograph was submitted to Yad Vashem by his aunt, Lola Politanski, who lives in Israel. Most of the Jews of Europe were dead by 1945. A civilization that had flourished for almost 2,000 years was no more. The survivors – one from a town, two from a host – dazed, emaciated, bereaved beyond measure, gathered the remnants of their vitality and the remaining sparks of their humanity, and rebuilt. They never meted out justice to their tormentors – for what justice could ever be achieved after such a crime? Rather, they turned to rebuilding: new families forever under the shadow of those absent; new life stories, forever warped by the wounds; new communities, forever haunted by the loss.